(Natural News) Michigan-based dairy farmer Denis Burke filed a guilty plea for harboring more than 100 illegal immigrant workers, and is to settle $1.38 million in penalties to the federal government. Burke, an Irish immigrant himself, owns and operates both the Dunganstown Dairy and Parisville Dairy farms located in the Michigan Thumb region. The dairy farmer agreed to sign a plea agreement admitting that he did not seek legal permission to employ more than 100 illegal immigrants that worked in his two farms. “[Burke] gave the illegal aliens free housing on or next to his farms so the illegal aliens would be readily available for work and less accessible to immigration authorities. By keeping the illegal workers on his farms and his farms in operation, Burke benefited financially and gained a commercial advantage over other dairy farmers who employed only legal workers,” Burke’s plea agreement read. The plea agreement also stated that the illegal immigrants’ lack of valid documentation hindered them from obtaining driver’s licenses and registering vehicles with the the Michigan Secretary of State. Likewise, the illegal immigrants’ status prevented them from opening financial accounts to cash paychecks themselves. “This is a classic case of harboring illegal aliens, and must not be tolerated, especially on such a scale. Not only is it unfair to Americans and legal immigrants who might have needed those jobs, it is likely that the illegal workers were exploited…Cases like these illustrate the need for a mandate for all employers to use E-Verify, to prevent egregious illegal hiring like this, and so that law-abiding employers don’t face unfair competition. In addition, more [Immigration and Customs Enforcement, or ICE] efforts to investigate these rogue employers should be supported with funding from Congress,” Jessica Vaughan, Director of Policy Studies for the Center for Immigration Studies, told LifeZette online. Data from the Pew Research Center revealed that there were 11 million unauthorized immigrants in the U.S. in 2015, which equated to about 3.4 percent of the total U.S. population. The center also found that there were 5.4 million Mexican unauthorized immigrants and 5.7 million non-Mexican illegal immigrants living in the country in 2015 and 2016. 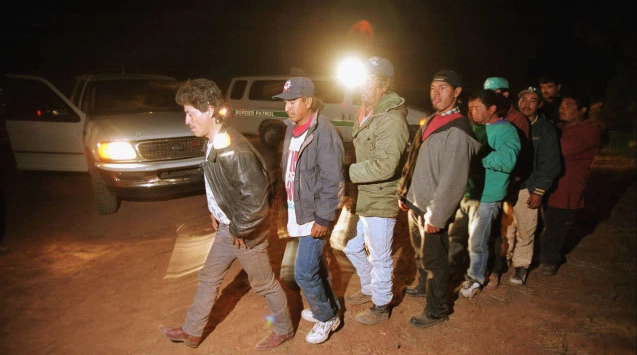 Furthermore, Pew data showed that the U.S. civilian workforce included up to eight million illegal immigrants. Burke could be faced with a verdict of 35 months in prison when he is sentenced on January 4. His wife, Madeline has also pleaded guilty to one count of hiring employees without checking their eligibility to work in the U.S.
Aside from the Burkes, another person of interest by the name of Yolanda Stewart has also been implicated in the legal dispute. According to reports, a police officer caught Stewart red-handed as she ferried five of Burke’s illegal immigrant employees in her car in 2013. It was also reported that Yolanda admitted to plotting with the Burkes and other farms in the area to help the illegal immigrants in purchasing their groceries, cashing their checks and remitting some of the money back to Mexico. “The biggest consideration here is sending a message to other employers that ICE is paying attention…And that will change the behavior of employers. When employers’ behaviors change, then the behavior of people who are contemplating coming to the United States illegally will change also,” said Ira Mehlman, Media Director for the Federation for American Immigration Reform.